Okay, I admit it, I've been thinking about The Mirror Project quite a bit lately, checking for reflective surfaces wherever I go, wondering how silly I'd look taking photos in various places. I even took a few photos in my office today with my trustworthy old Kodak DC3200. 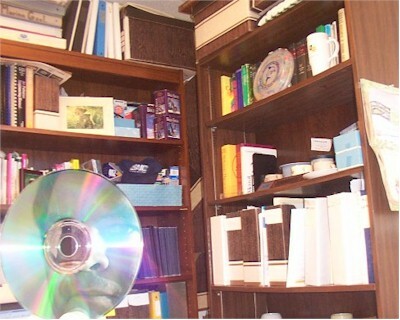 The door was closed, of course, as I tried to get my face and the view outside the window into the reflection from one compact disk. This is the only attempt that showed my face, but it doesn't show much from the window. The rest had nice reflections from outside the window, but no face.